Yes Love C09 | Light Your Nails! Today I’m showing you a nail polish that really surprised me. I purchased it a few years ago and then left it in a drawer somewhere until now. As usual. 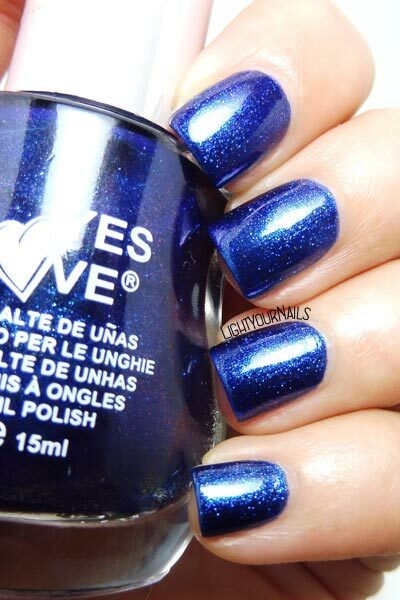 Yes Love C09 is a lovely shimmery night blue with a purple undertone to it. Coverage is not what you would expect from such a dark shade, but it’s perfect in two easy coats anyway. Drying time is quick and the finish is very glossy. Can I tell you the truth? I didn’t expect it to be so pretty! And I feel like it might be even better over a dark base. This was such a surprise considering it’s a very cheap brand. E' vero! Ho qualche Yes Love matte che adoro, ma su questo non avevo così tante aspettative, e invece! Lol! This poor, unloved polish! It's so pretty! Haha Kerry! I think I have too many polishes needing some love! I am not a huge fan of metallic blue polishes, but this one is something really special. I think it's borderline to a glassfleck which really makes it gorgeous! What a lovely blue! It practically glows! It does!! That's so gorgeous. It's so so pretty.. and the perfect shade of blue! Thank you! I really like that it's not too dark. This is awesome! I love when a mainstream inexpensive brand makes a hit like this! I agree! They used to have some lovely collections back in time. Se lo trovo lo prendo al volo!! Se trovi i loro smalti matte sono fa-vo-lo-si!